Iconic brand Victorinox has more than a century of tradition, quality and innovation under its belt crafting swiss army knives, watches and fragrances. From humble beginnings in 1884 when founder Karl Elsener opened his cutler’s workshop in Ibach-Schwyz, he went on to develop the Swiss Officer’s and Sports Knife – now the iconic Swiss Army Knife – in 1897, creating the foundation for the global company we know today. 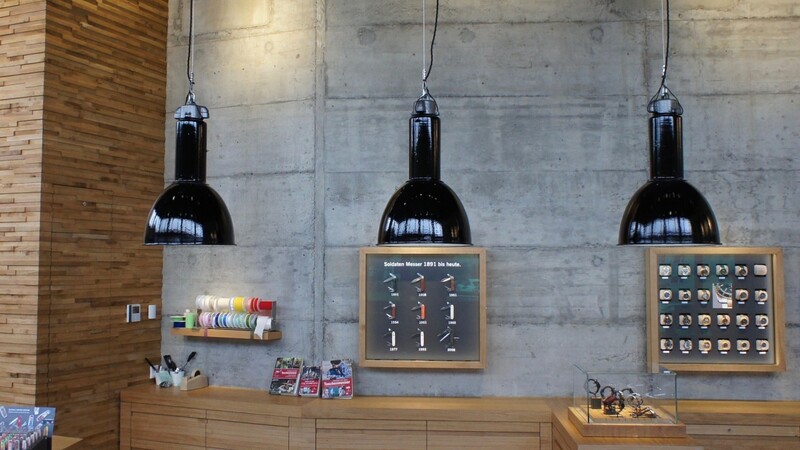 Black enamel shades salvaged from skinflint now feature over the main desk at its Ibach-Schwyz factory store. Salvaged from a factory in Germany where they were originally installed in the 1930s, the utilitarian lights with their lacquered steel gallery emphasise the longevity and heritage of the Victorinox philosophy.